Emmanuel has a +25 year of B2B experience (in FR, BE, US and intl (with Orange Business Services)). More recently, he launched and developed successfully Orange Intl M2M Center (for global connectivity market). 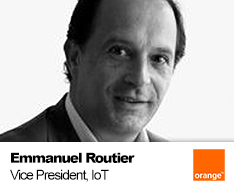 In 2016, he was appointed VP Verticals IoT & Analytics, to lead, deploy and manage Orange B2B vertical strategy.